Irish households will soon see an increase of just over 50% in the PSO levy they pay on their electricity bills. Announcing their decision today, the Commission for Energy Regulation (CER) said that the current annual level of €42.87 per customer will increase to €64.37 per customer from October 1st 2014. That's an increase of €21.50 per customer, over 50% on this year's level. When VAT is added, the total payable per customer per year will increase from €48.66 to €73.06, regardless of how much electricity they use. What is the Public Service Obligation (PSO) Levy ? All electricity customers pay the PSO Levy. It's a tax that's used to subsidise schemes designed by Government to support its national policy objectives related to renewable energy, indigenous fuels (mainly peat) and the security of energy supply. The proceeds of the PSO Levy are used to contribute to the costs of PSO-supported electricity generation which are not earned through revenue channels. The Commission for Energy Regulation is responsible for setting the PSO Levy payable by customers and for ensuring the costs borne under the PSO scheme are calculated correctly. The CER has no discretion over the terms of PSO schemes - its role is to calculate the levy and help ensure it is administered correctly. 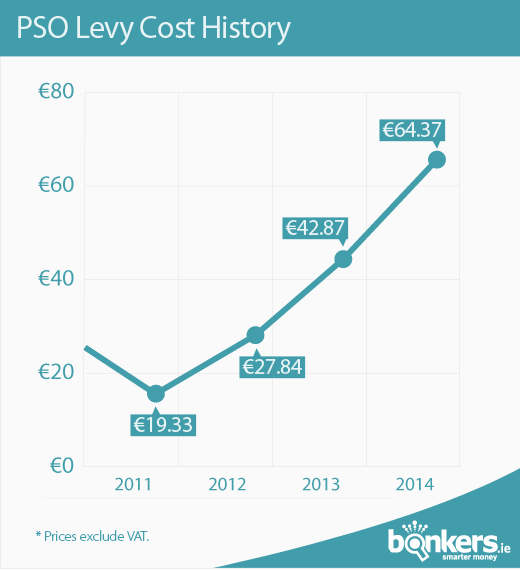 The PSO levy is due to generate €335.4M for the 2014/2015 year, a significant increase from the €210.9M in 2013/2014. Why the increase from €210.9M to €335.4M ? 1. Lower wholesale electricity prices. These have reduced by approximately 11% in the all-island Single Electricity Market from €64.28 per MWh to €57.17 per MWh. A lower wholesale price means that PSO plants need more PSO money to cover their allowed costs and is the biggest single driver in the rise to the PSO Levy. 2. Lower running of a 400MW gas plant at Tynagh, largely due to an increase in wind generation. The fixed costs of running the Tynagh plant need a higher contribution from the PSO fund. 3. More renewable generation. The generation of 138MW of electricity from renewable sources, largely wind farms, means that there is less generation required by PSO plants, hence those plants require further contribution to their running costs. The costs borne by the PSO Levy for the 2014/2015 period are: €94.3M for Renewables, €119.0M for Peat, €104.7M for Security of Supply and €5.6M for PSO CfDs. The PSO Levy increase is due to take effect from October 1st 2014 and will affect all domestic electricity customers in Ireland regardless of how much electricity they use. Although the PSO Levy is fixed per customer, it is possible to achieve significant savings by comparing electricity suppliers - bonkers.ie offers a free price check and is the only service in Ireland which offers customers the ability to switch to all electricity suppliers for free.